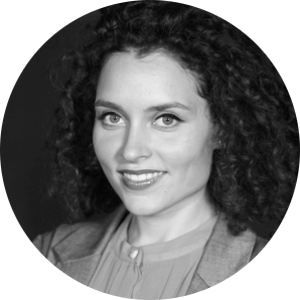 Eliza Petcheniouk is a consultant for innovation, Design Thinking coach and facilitator. In addition to trainings that aim at enabling participants to independently apply the methods, Eliza guides innovation processes with different demands for innovation. Her workshops are specifically designed to meet the individual needs and problems of the client. For this purpose, Eliza matches Design Thinking tools with other methods of innovation research. As a coach, Eliza places special importance on not only creating innovative solutions, but changing the culture of collaboration to WeQ. Design Thinking breaks and transforms familiar thought patterns. Using this method, Eliza introduces collaborative, user-centered and iterative ways of working. Participants learn to shift from problems to solutions, from products to users and from silos to systems as well as to appreciate mistakes as opportunities for growth.